So what does this all have to do with the Black Devil Martini? Well, nothing really. Aside from the fact that this makes for a great Halloween cocktail, made even better paired with a great Halloween costume. So grab yourself a Black Devil Martini and bring a shrubbery, it’s time for a Halloween party. 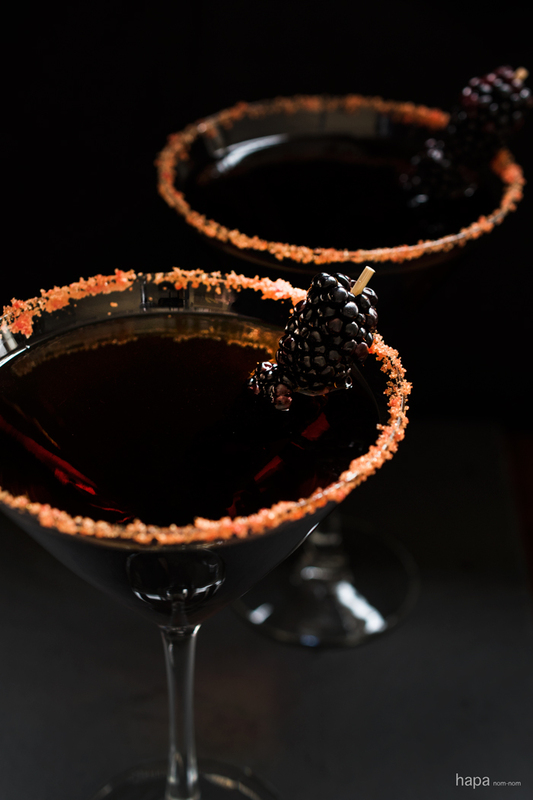 Black Devil Martini - Perfect for your Halloween party! Place the sugar in a small zip-top bag. Add a few drops of orange food coloring, or a few drops of combined red and yellow food coloring to the sugar. Close the bag and shake vigorously to distribute the color. Spread the colored sugar out onto a plate. Run the lime wedge around the edge of each martini glass and dip onto the plate with the colored sugar. Add 2 ounces of dark rum and ½ once of dry vermouth to each glass. Garnish with several blackberries, serve and enjoy! We’re total Python fans and what a great costume idea. We’ve taken notes. Wow what a fun cocktail! Perfect for Halloween! I can’t wait to try this! Kathleen, I love this!!! I’ve never really been into dressing up or Monty Python (sorry!) . . but recently I’m really into the Halloween cocktails so this is perfect! I also made a cocktail but yours looks scarier and cooler! 🙂 love that colored sugar. perfection! Being British I think it’s against the law to not like Monty Python, so I know exactly what you’re talking about. This drink is fabulous and love the spooky pics. Gorgeous drink…and your story is fun! I’m a fan of Monty Python and would gladly watch it again while sipping on this martini! Thanks, Claudia! I think you either love Monty Python or you hate it. Either way, I hope you have a wonderful Halloween! ” ’tis but a flesh wound…” 🙂 These martinis are sinister awesome, Kathleen. I have not seen the movie, but I will! 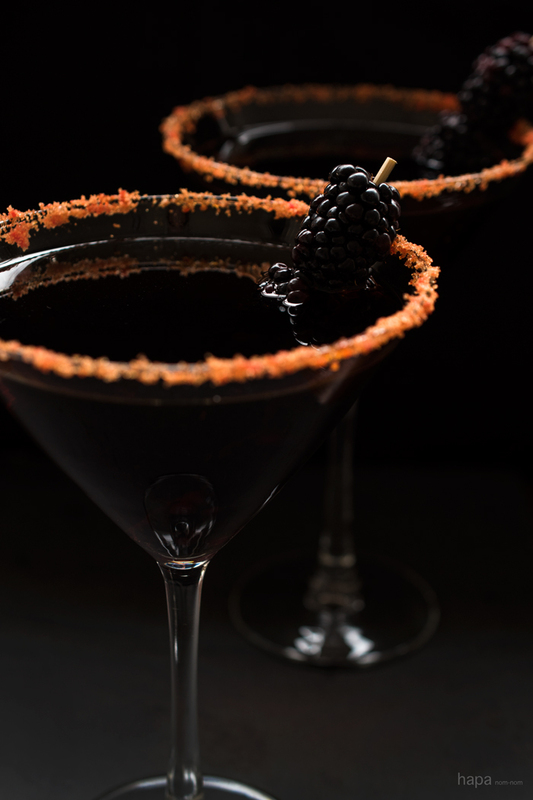 This spooky martini looks so good! Love it! Pinning to my Halloween board! AWESOME drink! That cocktail color is really dark and perfect for Halloween! So fun! That’s perfect for Halloween! Great idea! Pinned. I have to admit I haven’t dressed up for Halloween since I was a kid. Kinda sad, right? Mr. Salt isn’t exactly the Halloween type (originally from the UK where it didn’t even exist when he was growing up), and we don’t party much – ha. On Halloween I kinda wish we did. I think this Halloween we will at least watch something spooky on TV and hand out candy. I love the Terminator movies lol. Yes! I’ve found a fellow female Terminator fan!